Charm your guests with these stunning ruby red votive candle holders offering a good luck message! Beautiful shades of the East blend together on these wonderful votive candle holders from our exclusive range at Fashioncraft. 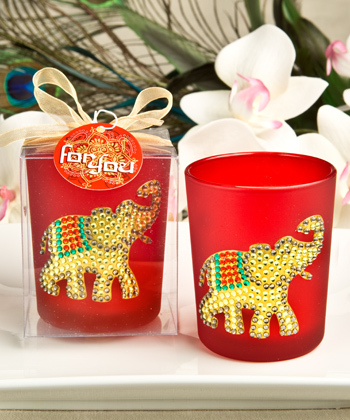 The elephant stands on a ruby red background and is adorned with myriads of rhinestones that sparkle and twinkle when the candle is lit. Best of all, the raised trunk brings good luck and is sure to get your occasion off to a great start. Featuring a white tea light candle and packaged in a stunning gift box, these favors will delight your guests. Offer the mystical allure of the eastern elephant at your next occasion! Perfect for weddings, showers, romantic occasions and any event where good luck is needed.